At the most importune time in the history of a fledgling nation, tragedy strikes. On the eighth day of the inaugural ceremonies for the Mishkan, in a terribly marring scenario, the Torah tells us that “the sons of Aaron, Nadav and Avihu, each took his fire pan, they put fire in them and placed incense upon it; and they brought before Hashem an alien fire that He had not commanded them to bring.” Immediately, “a fire came forth from before Hashem and consumed them, and they died before Hashem” (Leviticus 10:1-2). In the next verse, Moshe consoled his brother with words that may not have appeased lesser mortals, “of this did Hashem speak, saying ‘I will be sanctified through those who are nearest Me, thus I will be honored before the entire people.” Ahron understood the true meaning, implications, and essence of the message; and the Torah tells us “vayidon Ahron,” “and Ahron was silent.” The Torah uses words more powerful than Ahron was quieted. It tells us he was. The Hebrew word dohme has the same association as dohmaim, an inanimate object. That is how Ahron is described after hearing Moshe’s words: totally subdued and content. Rashi tells us that in the merit of Ahron’s subjugation and total subservience to Hashem’s decree, he merited to hear a Kohanic law, alone, directly from the Almighty, a route that normally precluded him or at best had him included as secondary to Moshe. The law bestowed on Ahron concerned the prohibition of kohanim in drinking intoxicating beverages before serving in the sanctuary. The Torah tells us, “Do not drink intoxicating wine, you and your sons with you, when you come to the Tent of Meeting, that you not die — this is an eternal decree for your generations” (Leviticus 10:9).Torah principles usually correlate the reward with the act that merited it. 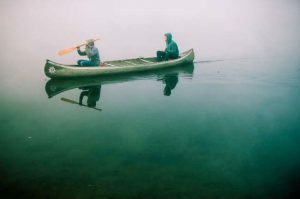 What, then, is the connection between Ahron’s silence in response to tragedy and his being the sole student of the Heavenly ordinance against Divine service under the influence? Why did the meritorious acceptance of the Almighty decree prompt a private transmission of the laws against priestly intoxication? Bill, and his friend were having too much to drink, when they collapsed in a stupor. Bill managed to fall on dry ground, while his friend had collapsed in the mud. When Bill awoke and saw his friend he thought that he, too, suffered the same filthy fate. Leaving his friend asleep in the grime, he stumbled toward town, looking for a bucket of water to wash himself. In the dark of night he found a bucket, brimming with liquid and sitting in front of the local hardware store. Bill thought it was filled with water. It was not. It was filled with whitewash. Intending to wash himself with it, he poured the contents over his body, and scrubbed thoroughly. Satisfied, Bill drifted toward a grocery for something more to drink. In order to understand the correlation between the prohibition of drunken service and Ahron’s stoic acceptance of Hashem’s decree, one must appreciate that a Kohen would, in his mind, drink to elevate his spirit, albeit artificially, and thus his service. As one who accepts Hashem’s decree, with no cry or outside manipulation, Ahron HaKohen showed that he understood that there is no artificial source for lifting spirits or understanding G-d. Peace and strength come from within the soul and spirit of those who service Him. When one is content with his perfect relation with Hashem, when he realizes that though he may have fallen he has the innate capacity to rebound, he needs no stimuli. Acceptance of a decree with no complaints is a recognition that the spirit, form, and embodiment, of a mortal being is completely subservient to the force of Hashem, content with his total situation with no need for outside dispensation, compensation, declarations, or mollifications. He is one with his Creator and His will. If you would like to be on a shiur update list which sends messagesregarding Rabbi Mordechai Kamenetzky’s various lectures in NY City and LongIsland and other locations, please send a blank email [email protected] You will receive bulletins about those classes. 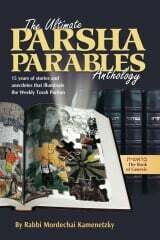 Copyright © 1998 by Rabbi M. Kamenetzky and Project Genesis, Inc.
Purchase Parsha Parables – from the Project Genesis bookstore – Genesis Judaica – at a very special price! 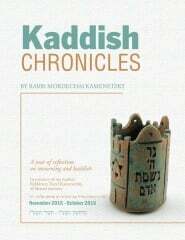 The author is the Dean of theYeshiva of South Shore.